NOTE: This is the third in a series of 31 reviews of scary short stories and novels. As part of All Hallow’s Read, I will be sharing all the scary stories that I think you should consider giving to someone for Halloween. Because this is a tradition intended for people of all ages, some of these titles will be for children and young adults, while others are meant strictly for adults. Happy Reading. After starting things off with some hefty reading I thought it’d be nice to give the kiddies something to enjoy. Since we’re already back in the mid-90’s, let’s take a step back one year further. Trust me, it’s easy. During the mid-’90s there was a God among us. His name was R.L. Stine. Before the saga of a boring teenage girl falling in love with an equally boring shiny thing that pretends to be a vampire, every kid of a certain age was reading Goosebumps. These books were Tales from the Crypt for youngsters. I’m also relatively sure the pages were laced with some kind of addictive chemical, because they couldn’t STOP reading them. Hell, they still are! 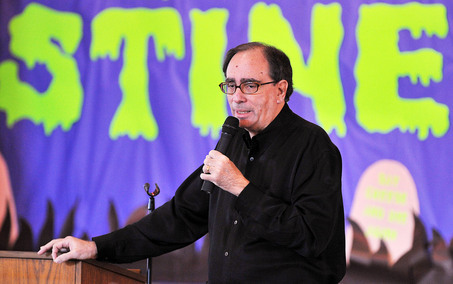 Stine continues to crank out Goosebumps tales today. Now, I was in no big way a “reader”. The extent of my literary prowess was reading the plot descriptions and critical blurbs on the backs of Stephen King novels. I found stories interesting, but my attention could not be held by them. Like the Goosebumps series, this problem continues even today. Out of all the books I own, and there are many, I’ve finished about 10% of them. Really, I may be a book hoarder. 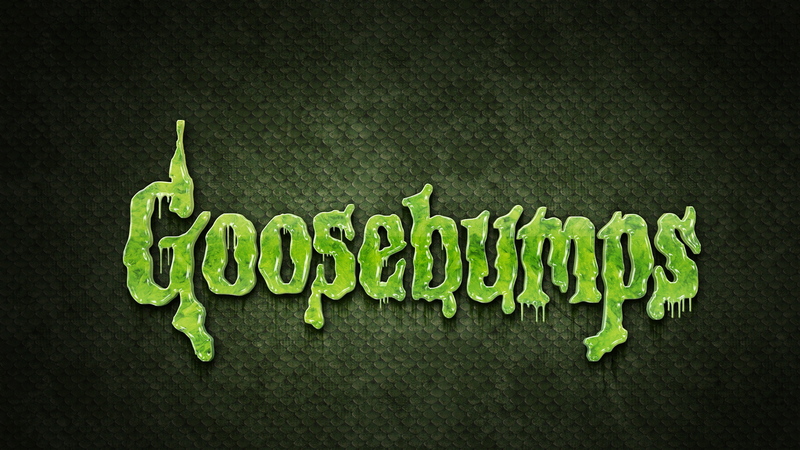 Yet not even I was immune to the viral Goosebumps disorder. My creatively formative years were shaped by movies and TV. Books didn’t move quickly enough got me. There was no immediacy. You have to work in order to be rewarded by the written word. I had no patience for it. Then came Goosebumps. Short, fast, nasty. They were like reading movies. Setup as “I’m this character. School and everything else bothers me. Only my friends understand. Oh, and there’s a monster in my basement.” You clicked with what was going on and to whom it was happening because it felt like you, or a friend, in your world. During this year we’re visiting, a television phenomenon began. One which helped cement my desire to spend my life telling stories. 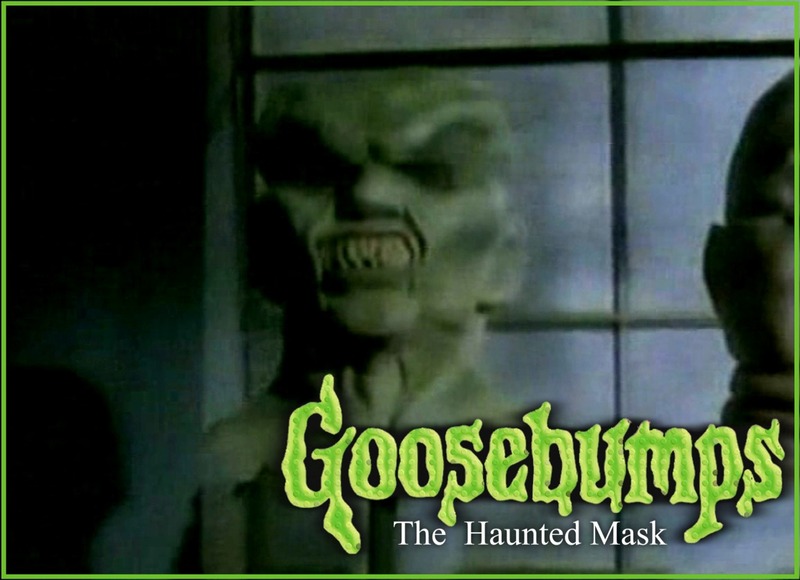 For Halloween Fox Kids aired a special one hour television adaptation of everyone’s favorite book in the Goosebumps canon: The Haunted Mask. I taped and watched it over and over. If there was anyone who hadn’t seen it, I brought it to them. This was the kind of children’s entertainment I’d been desperate for. My favorite show at the time was “Are You Afraid of the Dark?” There was nothing else like it. Fox Kids rectified that. Now there were TWO shows about kids like me coming up against dark powers and having to use their smarts to get out of it. The television series that followed the hour long special doesn’t hold up well. It’s painfully obvious how much of a cash grab it was. The makers of that show threw each episode together in an afternoon. Are You Afraid of the Dark? was constructed with much more love and care. Those shows hold up much better, some of the stories still effectively told. 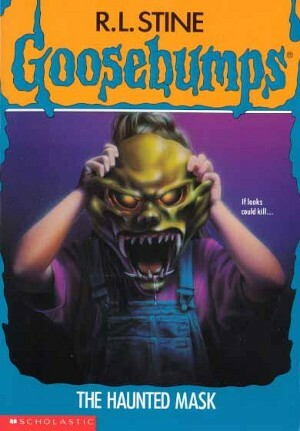 The only entry in the Goosebumps television chronicles that still works is that very first one: The Haunted Mask. Recently, I went back and viewed the episode. It contains some surprisingly twisted stuff. Nothing on the surface that would disturb children. More sub-textual that may not have even been intentional. The major example which comes to mind is Carly Beth wearing her mask, it’s evil starting to overtake her. She buries the papier mache head her mother made of her and starts to taunt it, snarling about how much better she is and how she doesn’t need to be the old bland Carly Beth who was afraid of everything. To the young viewer, this scene simply demonstrates the change occurring. When I watched it a little while ago, the scene is self-destructive and disturbing. Her mind is literally breaking down and abusing itself while doing it. Intended or not, that’s powerful. As many ravenous young fans as Stine has there is an equal amount of detractors. For a while, teachers at my school were telling students that they weren’t allowed to use any of R.L.’s books for reports. They were damaging to our young minds. We weren’t exposed to enough variety in order to fully develop. Besides, the books were gross. Over time I’ve come to agree with a few of their points. If every student did a report on the same book series then no one’s minds would be adequately challenged. Variety is important in development. But to ban them entirely was a mistake. I don’t know how many kids never would have picked up a book on their own if Goosebumps didn’t exist, but I’m willing to bet it’s a pretty staggering number. I think what some people have a problem with is the simplicity and lack of subtlety Stine employs. He’s not a guy who wastes any time. You know who everyone is, what they’re doing, what they’re motivations are, and the reason behind each and every action they take, in plain, often repetitive, English. This tactic can turn a lot of parents, and teachers, who read them to their children off. If they look at the structure itself, however, I think they would see how brilliant the form is. Like I said above, the books read like kids we know in a world we know, coping with dangers we’d like to face. There may not be an abundance of depth to the writing, but it achieves exactly what is intended – get kids reading. Not only that, but get them to enjoy doing it. Similarly to The Haunted Mask being the strongest of the television series, I think the book is also the one which still delivers. Though it may not seem like it at first, there’s a lot going on here. A lot for elementary school kids anyhow. This isn’t only the story of a girl who gets a haunted mask that turns her into a vengeful monster. In a lot of ways the story is about being accepting of who you are while also improving yourself. There aren’t nearly enough stories tackling that kind of subject. More often than not, children’s fiction wants you to believe, “Hey, you’re perfect just the way you are.” Which insinuates there is no need for personal growth. Just be who you are and never change. That’s silly, and a little irresponsible. As human beings we need to acknowledge we are not perfect, accept we will never become so, while constantly working on enriching our lives. Not for the sake of society, but for ourselves. Wow, I’ve gone into this story a bit too deeply. The Haunted Mask is perfect for All Hallow’s Read because it takes place at Halloween, uses that to its advantage, and tells an entertaining story. No one is likely to get scared by it, but the addictive property soaked into the edges of its pages may very well be an excellent gateway drug into a much scarier world.